The TSM 5 Tray Food Dehydrator has a 304 stainless steel structure. This stainless steel construction guarantees durability and robustness. This food dehydrator is resistant to rust: it does not corrode. This TSM dehydrator includes a timer which has the maximum timer setting up to 12 hours. It is eco-friendly and poses the least amount of impact on the environment. This Dehydrator is made of food grade stainless steel for safe, hygienic function and easy cleanup. It has a rear-mounted fan and louvered door; this maximizes horizontal air flow for the optimum results. TSM 5 Tray Dehydrator is a treat for those users who want to avoid plastic dehydrator jeopardizing health with chemical contamination. This dehydrator competes with its counterparts at the upper end. What Comes with the TSM Stainless Steel Food Dehydrator ? This section confers the amazing features of TSM stainless steel dehydrator in detail. It would assist you in getting yourself acquainted with the potential benefits this product can offer. Let’s investigate them in detail. Those customers who are never convinced to buy plastic dehydrator because of chemical contamination will prefer the TSM Stainless Steel food dehydrator. This dehydrator is made of food-grade stainless steel and thus BPA free and non-corrosive as well. This dehydrator has a wide variety of temperature range from 95 to 165 F. Dehydrating temperatures can be adjusted as well from 95 degrees to 165 degrees Fahrenheit according to food’s requirement. The TSM food dehydrator is the best way of enjoying dehydrated foods for the whole family. You can use your dehydrator to make jerky, dehydrated nuts, dried fruits, vegetables and make fruit leathers. This dehydrator measures 18.75 x 16.5 x 9 inches, is just the right size for most kitchen counters. Though a bit hefty for small kitchens, but is a perfect appliance for medium sized kitchens. TSM Dehydrator is a large capacity dehydrator as it provides over 8 square feet of drying space. It is quite handsome for a five-tray dehydrator. It serves perfectly a medium sized family. TSM Dehydrator is equipped with five stainless steel shelves with 0.25 holes in the trays. These shelves have 0.75'' spacing in between trays. These stainless steel shelves are constructed with 22ga - 304 food grade stainless steel, these trays will not rust. This appliance has a fan at the backside for horizontal air flow for even drying. Fan mounted on top and bottom of other dehydrators cannot dehydrate evenly as the air will be obstructed b trays. The front cover of this dehydrator has several louvers that allow the heated air to escape, thus help this product works efficiently and give optimum results in no time. Those large ventilators contribute to release the moisture quickly. It provides an even dehydration process and gets rid of the need to rotate trays because of the horizontal airflow. The exterior of this appliance is made from food grade stainless steel. It gives this dehydrator an industrial look. It would fit in great in your kitchen if you have a lot of stainless steel appliances. The silver color and hi-polished stainless steel with a mirror finish look appealing to eyes. The back cover of this machine is removable. It lets you have quick access to internal machinery, in case any maintenance need to be done or general cleaning. TSM 5 Tray Dehydrator is also equipped with a timer for easy cooking. This timer can be set for up to 12 hours. Turn on the timer and complete your chores without any stress. TSM Dehydrators are made in the USA, unlike most contemporary dehydrators, which are made in China. Manufacturer ensures the product to be of quality. To protect your food from getting over cooked it has an automatic shutoff option. This option comes in action when the timer limit is reached. This device is entirely rust resistant and will not corrode over time. This dehydrator comes with five stainless steel trays, which are perforated. These trays are not non-stick. The manufacturer offers a one-year warranty from the date of purchase. I this warranty the company will not entertain any loss, defect or wear and tear that occurs over the period. Technical information plays a critical role in judging the product, its capability, and functioning. Here is the detailed analysis of technical specifications of TSM 5 Stainless Steel Trays Dehydrator. There are five stainless steel trays having dimension 0.063'' H x 16.25'' W x 14.5'' D. These trays have 0.75'' spacing and 0.25 holes in the trays. These are rust resistant. The appliance has a good length cord, whose length is 72" long. Itis such a flexible option, which lets you set your appliance anywhere in the kitchen. The dimension of this dehydrator is 16.5 x 18.75 x 9 inches. Its size is not a problem for a medium sized kitchen. This item is heavier than the competitor items available in the market, due to its stainless steel body. The weight of this machine is 31.4 pounds, which makes it a bit heavier. You may find it difficult to change its place or to carry somewhere else. The material of this appliance is stainless steel. The trays are made from 22ga - 304 food grade stainless steel, which is robust as well as hygienic. This material had the edge over plastic material as it does not pose any threat to user’s health. This appliance consumes 800 watts and requires 120 volts to function smoothly and efficiently. The TSM dehydrator has a rear-mounted fan and heating element. To dehydrate the food efficiently this fan blows air horizontally from the back to the front of the machine. Thus all the trays get same air for complete drying. The thermostat of this appliance is adjustable having a temperature range from 95 to 165 F. The temperature gauge does not have numbers listing, but instead it is color-coded to a quick start guide, which is printed next to the controls. This color guide displays recommended settings for different foods. The manufacturer is offering one year warranty from the date of purchase. The heated air which is used to dry the food in the TSM food dehydrator is produced by the fan and 800-watt heating component. Both of them are located at the back end of the unit. The heated air is then blown across five racks at the same time, so it dries the food evenly. The control for temperature is located on top of dehydrator above the heating element. You can set the temperature by turning the knob. The on and off switch is also located on top of back end of the machine. This unit has a timer which has up to 12 hours limit. It has a timer that you can set and walk away, and it will shut itself off. Every product has some benefits that make them above their competitors. Let’s check out the advantages this TSM dehydrator offers. This machine cooks food evenly and doesn’t require tray rotation due to excellent air flow throughout the trays. TSM Dehydrator has the benefit of quick and fast heating up. The directions for set-up are easy to understand. It makes jerky in just 4 hours. The best thing is that most of the heat is contained within the machine. This gadget has a nice appearance with silver color and stainless steel finish. If your kitchen has other stainless steel appliance, it would complement them and enhance the outlook of your kitchen. The five trays that come with the appliance can hold quite a good amount of food. It’s quite a decent capacity for this small dehydrator a plus point for TSM Dehydrator. Amazingly with a powerful 800-watt heating system, this dehydrator works silently. Even in small houses, it is very feasible to use this dehydrator for long hours. The front door can be removed for easy access to the interior of this dehydrator, thus making the cleanup easy and effortless. The removable rack system makes cleanup a breeze as no holes, clips or other obstructions are in the way. The back door is removable; hence it is also easy to maintain the overall hygiene of this dehydrator. This machine is robust, sturdy and long lasting, thus it would be your cooking partner for years long. Front cover of this dehydrator is great; it is easy enough to put it on/off. The best thing is its handle remains cool when the machine is operating. The cover does not rattle when in place during the operation. Color coded temperature controls let you identify the right temperature for your recipes, thus makes it possible for you to cook your food with a perfect crisp and preserved taste. It is a versatile machine with a vast temperature range, suitable for stuff like petals, herbs and fruit leathers till meat for jerky. It has a power indicator light, which verifies the users that the appliance is working. So better stay conscious and don’t let children come near the device. The TSM Dehydrator has some flaws which are must be mentioned here for the consumers who are interested in buying this product. The TSM food dehydrator is a large appliance which is difficult to be accommodated in small kitchen shelves. You may notice that its size is a bit bigger than the microwave oven. The machine did not come with accessory items, no jerky seasonings or sheets for fruit rolls, fruits leather. The steel used in this dehydrator is not nonstick, so you have to use paper parchments or mesh sheets to keep the food from sticking on the trays. If you want to put more trays while dehydrating the food to cater your need for a big batch, then you would be disappointed upon knowing that the number of trays are fixed and cannot be increased. There is no temperature gauge in this appliance, it just mentions Low and High, and that is quite an issue because you have to buy a separate thermometer to gauge the temperature. It is not safe to leave the children unattended when near this appliance, because it gets scorching, so you cannot or do not want to leave it alone. Sides of the unit also get hot but not scorching, so make sure children and flammable items are not nearby. This product is quite expensive as compared to the standard dehydrators available in the market. Q: Does This Dehydrator Need Ventilation When It’s Working? Yes! It needs proper ventilation because heating element and the fan is at the back, and it can get sweltering. Q: Does This Dehydrator Have a Polished Stainless Steel? Yes, this dehydrator has a polished stainless steel. Q: Can I Use This Dehydrator in Any Country Other Than the US? Q: What Is the Finish Look of This Dehydrator? This dehydrator has a mirror finish. It's better to use the sheets while drying the food. Using the sheets is tidy and handy as well, especially for juicy and squishy foods because these foods can spoil the trays and would make the cleaning process way too difficult. Q: Is This Dehydrator Made N USA? Yes, the dehydrator was made in the USA. All the quality and safety standards were followed while manufacturing. Q: Are the Trays 1/4" or ¾"? The trays are .063" thick with .75" spacing. Q: I Don't Understand the Front Panel of This Dehydrator, Do We Slide It? Yes, we need to slide the front panel to close the dehydrator. The door can be removed completely for cleaning purpose. It is a louvered door. Q: Are the Trays Stainless Steel or Chrome? The trays are stainless steel. Q: Does the Company Offer Drying Sheets with This Dehydrator or Do I Have to Buy Them Separately? No there are no accessories offered with this dehydrator. You have to buy separate silicon sheets from r fruit leather or jams. Q: What Is the Size of Perforated Holes in Stainless Steel Trays? The trays are perforated for proper air and heat circulation. The holes in trays are about 0.25 inches. Q: What Drying Capacity Does This Dehydrator Offer? The five shelves measure 14.5 x 16 inches, which comes to a total of 1160 square inches or 8 square feet. Perfect for a medium sized family. Q: What Is the Material of Machine's Interior? Other Than Trays. The whole machine is made of rust-resistant stainless steel. And it does not corrode over the time. Q: Do We Have to Use a Digital Thermometer Separately to Gauge the Temperature? Yes, you have to buy a separate thermometer and put it inside the door, there is a place for the thermometer in the door to measure the temperature while drying. Q: Can I Buy More Stainless Steel Trays Separately? Yes, you can order them directly from the manufacturer's website. Q. I live in Europe, and I need to buy this dehydrator, will it work on 220 Volts? No, it only works on 120 volts, you are required to buy a converter for this appliance to get it worked. Yes! You can dehydrate whole fruits, but drying would take longer as compared to the fruits cut into small pieces. Q: If I Require a Temperature Setting Below 90 Degrees, Can I Acquire This Temperature? The thermostat setting starts from 95 degrees up till 165 degrees, so there is no way you can set the temperature below 95 degrees. Q: Is This Dehydrator Make Noisy When Operating? No, this dehydrator is very quiet; it won’t bother you while you are working. Q: Where Is the Fan Located, on Top or at the Back of This Dehydrator? The fan is rear mounted. It helps to dry the food evenly and efficiently n gives the much-loved result. 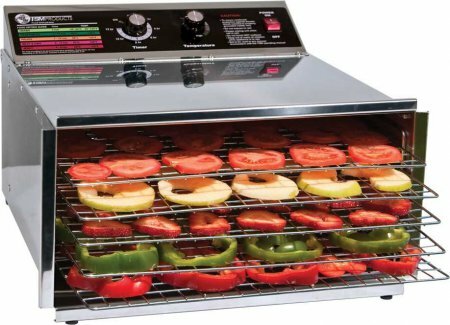 The TSM 5 Tray Food Dehydrator is an easy to assemble, easy to clean, the perfect machine for all the foods. It is a well-made stainless steel dehydrator with a timer. It looks amazing, and also features comfortable front and back door removal; it gives the peace of mind with food-grade stainless steel. If stainless steel is vital to you, and you don't need a big capacity dehydrator, then the 5-shelf TSM dehydrator is an excellent choice. With its square design, it dries food evenly. It heats up quickly and it cooks evenly, there is no need to rotate food/trays. It also has a self-stop timer so you can go to bed and empty it in the morning. This food dehydrator is a grand way of enjoying conserved foods for the whole family. This item is quick, quiet, well built and a thing of beauty.